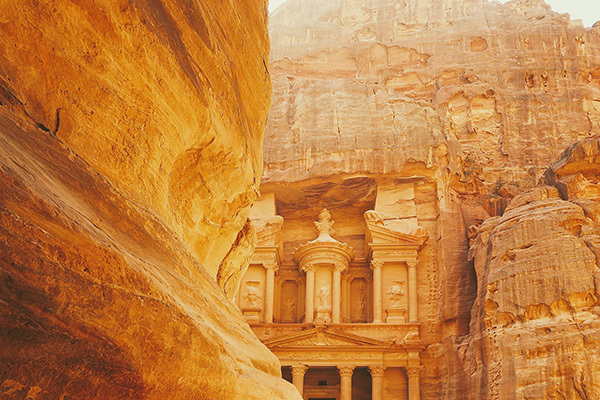 Most people think of Petra when they first think of Jordan. 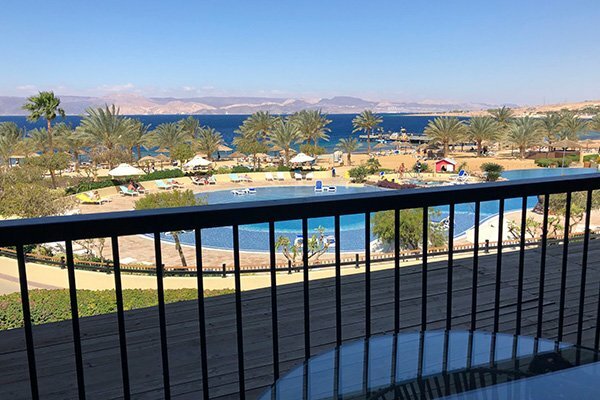 But with the increasing flights into Aqaba, right next to the Red Sea, more and more people are choosing a Jordan Beach resort vacation. 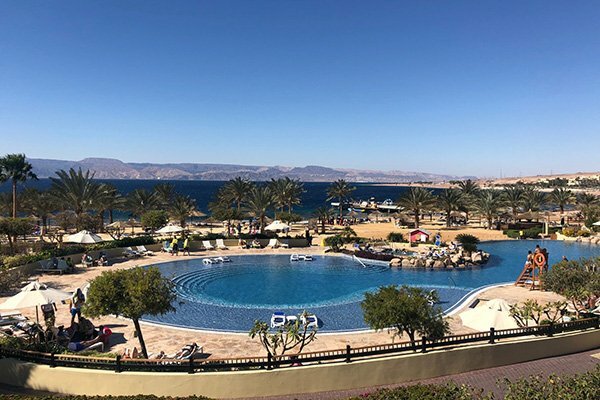 They can enjoy sun, waves, pools, kids clubs and relaxation while taking day trips to some of Jordan’s most popular tourist sites. While I have been to Jordan several times, this was the first time that I got to experience a Jordan beach resort on the Red Sea! If you did not know that Jordan has fabulous beach resorts on the Red Sea, then you are in for a treat, just 15 minutes from Aqaba airport, even closer to the Sea Port and less than 30 minutes from the Israel border you will find Tala Bay, an area on the Red Sea that offers holiday makers everything they want in a Jordan beach resort vacation! With a view like this from Movenpick Tala Bay, I was in heaven! What to look for in a Jordan Beach Resort? There are a few things to look for when booking a Jordan beach resort. Restaurants, room choices, pools, activities, kids clubs, bars and nightlife are just a few. Everyone has their own reasons for booking a Jordan beach resort. Keep each one of these things in mind when you choose what works for you. Little Birds Kids Club had my kids begging to go back the net day! there were plenty of other kids to play with, those from all over the world! 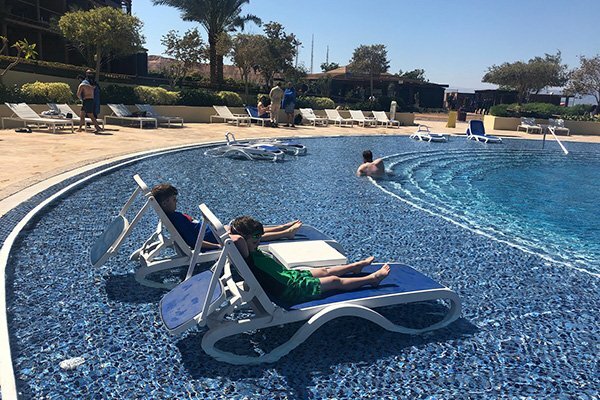 Movenpick Tala Bay has an active kids club, called Little Birds Club, with a kids pool, covered playground, indoor space, nap room and daily activities. 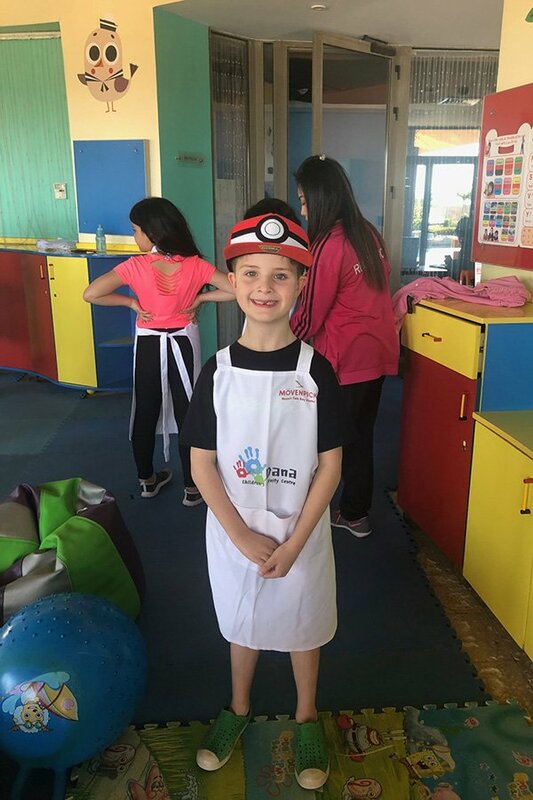 The daily activities are more than story time or paintings, on thursday’s the kids are taken to the real hotel kitchen and given an opportunity to decorate cookies with the chefs at the hotel! They get a glimpse of what a real commercial kitchen looks like! While most parents tailed along to see what their kids got up to, it was above and beyond what I have seen in kids clubs. The Kids pool and lounge area for those with little ones! Movenpick Tala Bay has a buffet restaurant as well as an Italian restaurant.There are 6 other places to get food and drinks whether you are poolside or want a sit down meal! The staff are excellent and attentive and the buffet has plenty of choices. If you are sitting by the pool, you will find your servers are on rollerskates! For breakfast, Movenpick Tala Bay had more than enough options to satisfy everyone’s morning desires! Whether pancakes or an omelette or a typical arab breakfast, there is plenty to enjoy! 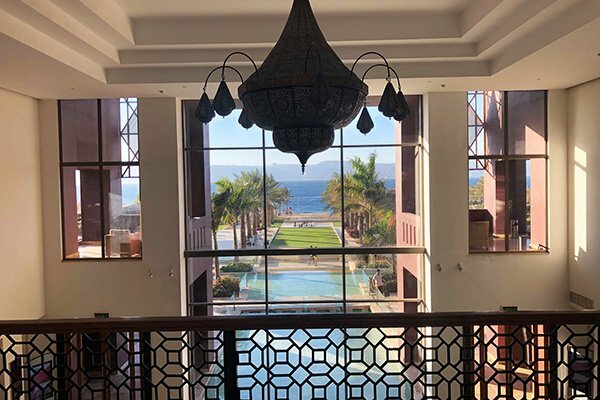 with these balcony views of the Movenpick pools and the Red Sea, you will not want to leave your room! Families come in all shapes and sizes. Whether you are a couple, a family with young children, a family with grown children, there is a room at the Movenpick Tala Bay that works for your needs! With balconies and ocean views, or walk out pool rooms, check into all of the different room choices for your Jordan beach resort and pick one that suits your family’s needs. Once you have found out which room best suits you, enjoy coffee and tea and a minibar in each room. When you are looking for a Jordan beach Vacation on the Red Sea, you want beachfront right? 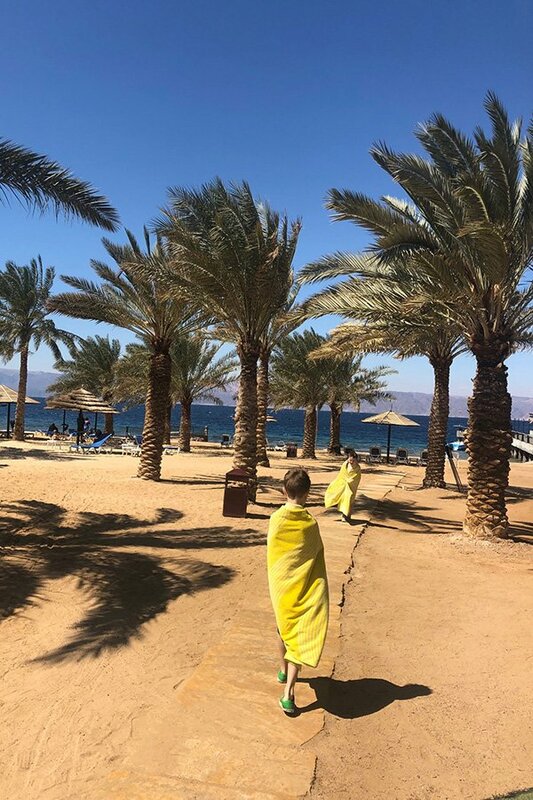 There are lots of hotel options in Aqaba, but if you are visiting Jordan for a beach vacation, it is important to pick one that is actually on the beach. You will not find miles of beautiful beaches right in Aqaba, although there are public beaches right in town. If you want a hotel with a beach, you need to choice the best Jordan beach resort. Those are located in Tala Bay. Movenpick Tala Bay has 150meters of private beach with beach chairs and relaly cool privacy tents that block the wind in the spring and offer guests some privacy while they enjoy the beach. Wifi by the Pool? No Problems! Wifi is something that today’s traveller requests. 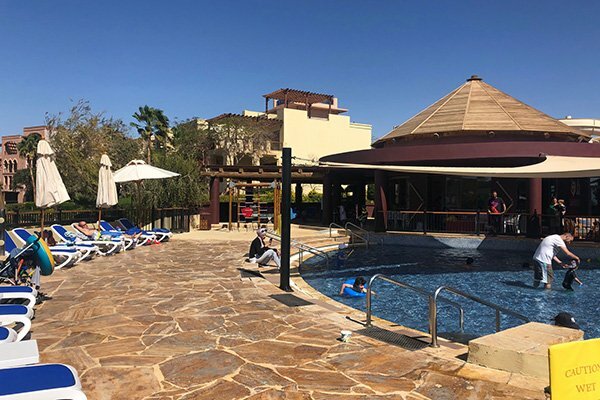 At Movenpick Tala Bay, there is excellent fast wifi in the rooms and you can even connect by the pool! I found a few spots to not connect as well, but a few steps each way and I had a perfectly fast signal. One of our family hotel musts is SPACE! Give us some room to move around, let us enjoy our room and Movenpick Tala Bay offered that! With a sitting area, a kitchen table, two bathrooms and a king size bed, this suite was perfect for our family! Maybe you are a vacationer who likes to be pampered? Well Movenpick Tala Bay has the Zen spa to take care of your every need while you enjoy your vacation in Jordan. Movenpick Tala Bay offers stunning views of the Red Sea from all over the resort! If you want to leave the resort and enjoy some culture in Jordan you can take the shuttle into Aqaba. 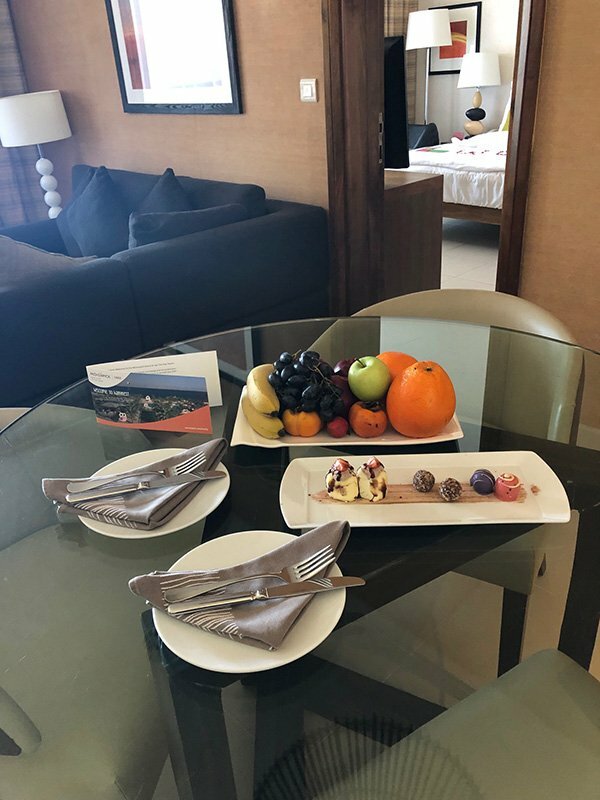 It is free and will drop you at the other Movenpick property to allow you to explore Aqaba, do some shopping, eating or enjoy a coffeeshop and shisha. Wadi Rum is another day trip option and just an hour from Aqaba. Wadi Rum is one of my favorite parts of Jordan and you can visit for a jeep tour or lunch in one of the Wadi Rum camps. ARE YOU CONVINCED? CLICK HERE TO BOOK YOUR STAY TODAY! 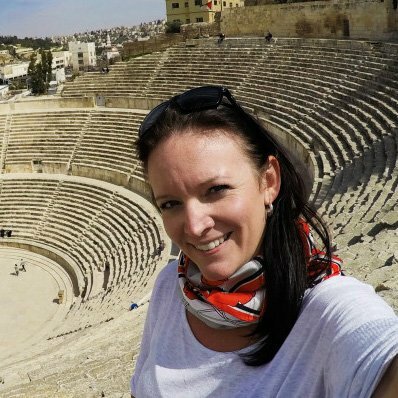 What to wear in Jordan gives you information for packing for a modest country and what to wear outside the resort.